Philips is running “Wake Up The Town“, focusing on the Arctic town of Longyearbyen. The capital city of Svlbard experiences a polar winter without sun from October 28 through to February 14. Documentary filmmaker Doug Pray, known for his films Art & Copy and Surfwise, is spending the winter in Longyearbyen following an experiment with the Philips Wake-Up Light. The campaign is online at wakeup.philips.com, YouTube and Facebook. The Wake Up campaign is being developed at Tribal DDB Amsterdam, Netherlands, by chief creative officer Neil Dawson, creative director Chris Baylis, art directors Paul Fraser and Mariota Essery, designers Simon Cook, Leigh Hibell and Stella Yu, 3D artist Joris Blomjous (3D), account managers Sandra Krstic and Nick Basermann, strategist Joey Duis, technical lead Jan-Willem Penterman, user experience designer David Vogel, producers Jeroen Jedeloo and Jolly Banerjee. Filming is being shot by director Doug Pray via Stamp Films, London, with director of photography Denzil Armour-Brown, producer Scott O’Donnell, composer Garron Chang and colorist Michael Gossen. 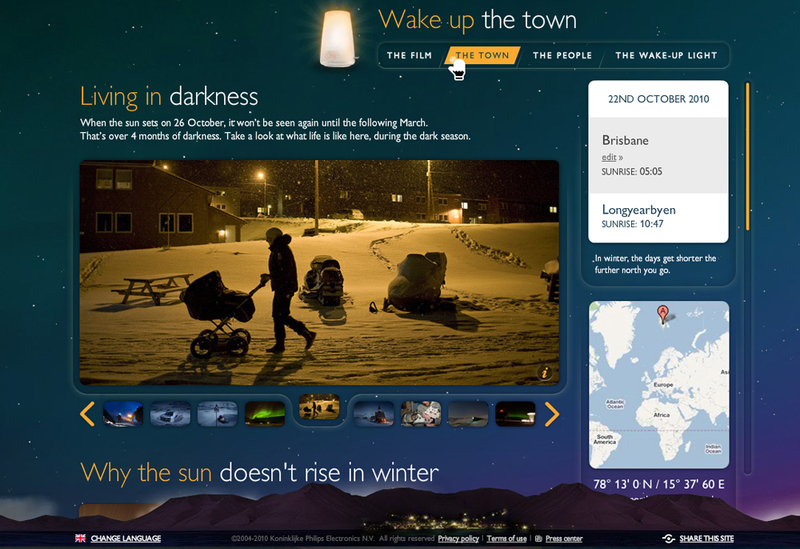 The Wake Up The Town site was developed at Group94, Ghent, Belgium.